Lo and behold, for the dark illustration has been long in the making out of inspiration for Toxic Vision Clothing whom had a powerful impact on what I saw months ago. Her work is visceral and experimentative on the edge of her passion with all things metal and of the darkness itself. Note that Toxic Vision's page may or may not be NSFW. View at your discretion. My idea was to add some latin phrases to play with the theme of the illustration and of her as a character. And so I titled it " Dark Mistress of Wolves ", or shall I say " Tenebrarum domina luporum ". UPDATE: It's officially " Tenebrarum domina luporum ". 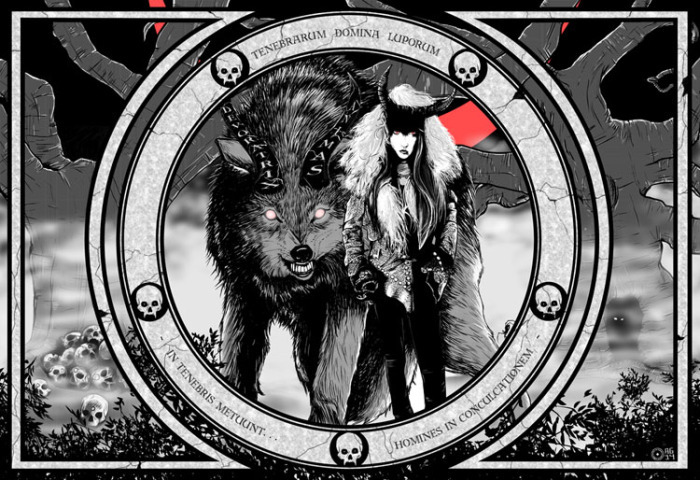 The horns on the hellhound are inscribed " Devoratrix Animas " which is to say " Devourer of Souls " and, lastly the bottom inscription " In tenebris metuunt. . . homines in conculcationem " says, " In darkness shall mortals fear to tread " ( and I hope Google Translate did its job accurately although I've always wanted to learn some Latin for years ). Then I added skulls and some unknown creature inside a tree which could be a shadow child. I wanted to add a bit of color this time around since my big piece with the Marquis tribute, so eventually it was going to be grayscale with some red tints. Finally, the coup de grace was the invisible upside down five-pointed pentacle connected by skulls in the frame, for those who may be acute enough to notice it. It was the first time I did a large scale illustration in Manga Studio with the Marquis at the time and I knew I wanted to do it again which led to this. It was not a simple project since it has had some setbacks with the background having been changed a few times and adjusting some things on certain elements to create a sense of balance. This piece is huge at about 34 by 24 inches in size which had to be done in high resolution and that size alone is my insurance that in case I decide to have a large scale print of it without losing any quality by downscaling it. EDIT: And seeing that beguiling photo of hers prompted me to think that there is story there to tell. Why was she wearing that furry hood? And those eyes. . .what have they seen? And the horns. . .what supernatural creature is she? I eventually plan to make more like this in the future as it's been a fun project to do. Those who are into heavy metal fashion and art from the other side in darkness, check out Toxic Vision. Her work is one of a kind and visceral. The photograph which the artist modeled for herself in her gallery.